View Virginia's Blog View Virginia Robertsons Facebook page View Virginia's Pinterest page. WHOLESALE CUSTOMERS If you are a quilt shop and want to order our patterns please call for information. 970-882-3389. Click here to check out our sale items and samples for sale. Shipping is included in the prices for the continental USA. Extra shipping is needed for other countries.We no longer ship fabric kits outside of the USA. We do not run your credit card for extra shipping without your written permission. We try to ship within the week of receiving your order, but please allow three weeks for orders to arrive. The Dresden Plate Wedding Ring pattern has been revised. A runner with a pieced background option is included in the new pattern. Go to Virginia's Blog to see a tourtorial. Click here to order the pattern. The Hen pattern is 20 " X 23 1/2". This design will go well with the Rooster pattern. Click here to order. 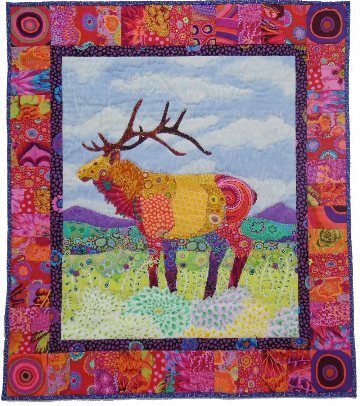 The Technicolor Elk is a 30" X 34" appliqued wall hanging. Make it from wild fabrics or batiks. Click here to order. This Stack Of Cups wallhanging is 16" X 37" and features quilt as you go appliquilting. Click here to order the pattern or fabric kit made from Kaffe Fassett Collective fabrics. Improv Still Life Quilts by Virginia Robertson is a new art project. There are two patterns included. Click here to see the other quilt and for more information. The Rooster pattern is $10.50. This variation was just created for the Copper Needle Quilt shop in Payson, Arizona.Click here for more information. The Big Red Bag opens to 23" across, is 13" tall and 8" deep. Click here for more information. This pattern has a color, step-by-step toutorial on Virginia's blog. The Microwave Bowl pattern is a 10" pattern for a quilted hot pad/bowl that is safe to microwave your dinner. Zap your plate in the hot pad and take it out with the hot pad protecting your fingers from the hot plate. Click here to order and to see several more new hot pad patterns.